I n high school I was a big Jimi Hendrix fan. He was the first great guitarist I listened to. I read one of his biographies, ‘Scuse Me While I Kiss the Sky, multiple times. My favorite album of his at the time was Are You Experienced?, the one that started it all. 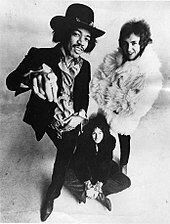 The Jimi Hendrix Experience was one of the first great power trios. It put the focus on Jimi’s innovative style of playing guitar.This doesn’t mean the other members were slouches. Noel and Mitch were excellent musicians in their own right, able to to complement Jimi. They just weren’t well-known names like Ginger Baker and Jack Bruce when Cream was formed. Noel was actually a guitarist. What Ritchie Blackmore appreciated about Hendrix was that he was always searching for the right note. He pushed the boundaries. And when he found that note it was amazing. This goes back to your idea of what a musician, particularly a lead guitarist, is supposed to do. Some people want a band to perfectly reproduce their music live. If you listen to Matthias Jabs of the Scorpions, you wonder if he ever misses a note. But the reason I love live music is the improvisation. That is probably why I love Blackmore so much. It is a reflection of my personality. Blackmore often begins and ends his solos with “standard” solos, phrases from the studio recordings, and then improvises. He’s on the tightrope. One of the weird things about the album is that the title track is the last one on both the U.K. and U.S. versions. The U.K. version included Red House, Remember (which I don’t remember hearing- perhaps it wasn’t memorable) and Can You See Me. The U.S. versions included Hey Joe and The Wind Cries Mary instead. Red House shows up on other collections so Americans could enjoy this great blues rock number. It was frequently played on the radio here in the States. It is a song that has stuck with me. The mood changes slightly with Manic Depression which supposedly isn’t about bipolar disorder. It is essentially about not being able to get what you want. Perhaps it is about Jimi’s inability, even his, to produce the sounds in his head expressing (I know what I want, but I just don’t know, how to go about getting it). It has the feel and timing of a jazz song more than a rock song. As a teen who seemed to be on the outside looking in, this song captured some of how I felt. Hey Joe is a cover of a oft-covered blues song by Billy Roberts. Deep Purple also did a version of this song. This is still the standard version of the song for many of us. Straight up blues. They go back to psychedelic with Love or Confusion, May This Be Love, and I Don’t Live Today. The tempo is faster, and the guitar work is great. Sadly these are all pop songs too. They were made to be played on the radio. The last song on the side is the longest at 3:55. Purple Haze is an all too short 2:45. You are left wanting more, especially from a guitarist this good. I had the same feeling with the first Van Halen album. The songs really didn’t have extended solos, which is precisely what I want, but both albums made their mark. Perhaps it was simply an issue of money. The budget for this introductory album was small, and studio time was at a premium. It takes time and money to put together longer songs. 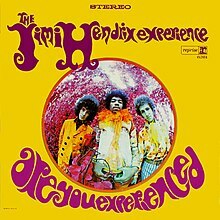 The rest of the album is also full of songs under 4 minutes with the exception of Third Stone from the Sun, which is 6:40 of Jimi using feedback and pedals for a strong psychedelic feel. But it starts with Jimi’s nod to Bob Dylan in The Wind Cries Mary. It isn’t a Dylan song, but you’d swear it was. Back to fast-paced rock and roll with Fire about passion. This is something any teenager can identify with. His guitar work mirrors the urgency. After Third Rock, is the song that starts the U.K. release, Foxy Lady. This is a classic guitar song about an attractive woman with attitude. This another one of the songs on this release that has stood the test of time despite the ‘dated’ style. The album ends with the title track. The rhythm, bass and drum tracks were backwards, which Mitch reportedly hated trying to do live. It added to that psychedelic feel. This was a ground-breaking album that broke a ground-breaking artist. There really isn’t a bad track on this album. The only weakness is that you want longer solos, to hear more of this incredible guitarist. After my collection was stolen in the late 90’s I never replaced this album. Putting this together makes me think it is time to do so. Another quarter, and another volume of Nick Needham’s church history set, 2,000 Years of Church History. The second volume covers The Middle Ages. I mentioned the layout of the books in discussing volume 1. This volume is about 440 pages long. Reading about 10 pages per day, I was able to read a chapter a week and be done in 10 weeks. This makes for a very doable project, and you aren’t overwhelmed with all the information that is found in this thus far excellent series. He begins this volume with Islam and the Church. We’d join Paul in saying that even if an angel preaches another gospel to you, they are to be anathematized (Gal. 1). While Mohammad claims to have received a vision from an angel, his message is very different from Paul’s gospel and therefore to be rejected. Islam did spread through military conquest. Some of the churches in conquered lands were treated fairly well, particularly the Arian and monophysite churches. He distinguishes between the Sunni and Shia muslims in addressing their first “civil war”. Most Christians were placed in segregated communities and treated as second-class citizens, often with a heavy tax. At times they benefited from the Christian community. Nestorian Christians in Persia translated the great Greek philosophers into Arabic. Generally “Christian governments” waged defensive wars against Islam. A few people like Francis of Assisi preached the gospel to them. Some of the crusades seem far less interested in protecting pilgrims and freeing conquered Christians than gaining fame, power and wealth. Needham then discusses Charlemange and the Holy Roman Empire. The struggle between civil and religious authorities would take up much of the Middle Ages. This was not limited to the Pope, but we also see the Eastern Patriarchs, at times, seeking to bring the civil authority to heel. It was a back and forth. He also addresses developments in theology and worship in both the Eastern and Western Church. This volume continues Needham’s broader than usual focus. This is not a Eurocentric approach to church history. For that I am thankful. For instance, much is said about the development of both Eastern and Western monasticism. We see the repeated influence of Augustine in controversies involving predestination and the Lord’s Supper. Communion controversies appear at least 3 times in this volume. The third chapter focuses on the Byzantine Empire and brings us to the Great Schism. The iconoclastic controversy takes up a bit of space. It was a ruthless controversy with Emperors deposing Patriarchs; Patriarchs excommunicating Emperors, exiles and cruel punishments. Church history is not pretty! This should put to rest any mistaken notion about the consensus of the Patriarchs as preferable to “sola Scriptura”, but sadly it won’t. The filioque controversy regarding the Nicene Creed is discussed. In the east, you had some dissenting movements: the Manichees, Paulicians and Bogomils. 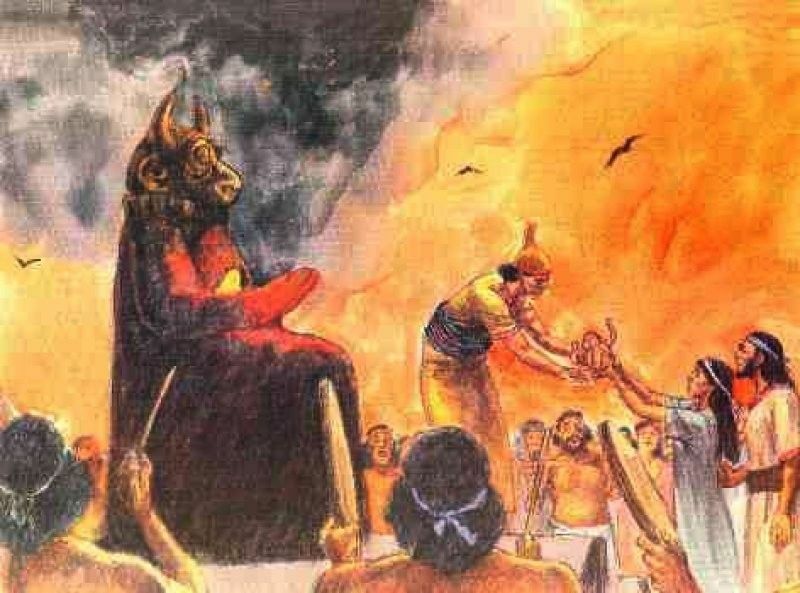 All three were connected to Gnosticism. Paulicians often allied themselves with Muslim Arabs against Byzantium, whom they saw as oppressors. The Bogomils were in Bulgaria, which was a region over which the Eastern and Western Churches struggled. They would not survive the conquest by the Muslim Turks in the late 14th century. Needham then moves back West for the Cluniac Revival, influence of Hildebrand and the Investiture Controversy. The Norsemen proved to be a problem for much of the Western church. But eventually they were converted to Christianity. Over the course of about 100 years the gospel spread from the lands the Norseman conquered to the lands they came from (Denmark, Norway, Sweden, Iceland and Finland). The gospel also made headway into eastern Europe as the Bohemians, Poles and Croats were converted. Alone with this was a reformation of Western monasticism aka the Cluniac Revival. They also sought purification in the leadership of the church. Hildebrand led the efforts to reform the papacy. He wanted it to be independent of the state in order to pursue its spiritual purposes. This would lead to the Pope investing kings with power. Popes, for a time, were king makers. One unfortunate side effect was that ecclesiastical officers were freed from prosecution from the state. Their crimes were considered sins and subject to the discipline of the church- a practice that helped produce the sexual abuse scandal that rocked the American Roman Catholic Church, particularly in Boston (don’t worry, I don’t deny that Protestants like to cover up a “good” scandal too). The fifth chapter examines that less than period of time covering the Crusades. He looks at the causes and history of the Crusades. Not all crusades were created equal. Some were worse than others as the trade cities exerted their power. Needham then moves into the manner in which the gospel came to the Rus, how they had their own patriarch and became an independent Eastern Church. The Mongols factor heavily in this. After the defeat and removal of Mongol control, many Russian Orthodox began to think of themselves as the “third Rome”. Because Byzantium had “sold its soul” in the Union of Florence (in order to receive military assistance against the Turks) Russia saw itself as the heir of orthodoxy. Back to the West, the book then delves into the rise of the universities and scholasticism. Aristotle “came west” and exerted great influence on the theology of the Church at this time. Needham gives summaries of Anselm, Peter Abelard, Peter Lombard, Bonaventura and Aquinas among others. The Papacy reached its height in the time of Innocent III. There were a number of theological developments (transubstantiation was made dogma), new monastic orders (Franciscans and Dominicans) and humbling of kings. There was also the crusades against dissenters like the Albigensians and Waldensians. Back to the Eastern Church he develops the fall of Constantinople. The battles with the Muslims, particular the Turks, continued to take their toll. There were also controversies like the hesychastic controversy involving Gregory Palamas. He relates the various attempts to heal the Great Schism, all of what came to nothing since they were mostly about receiving military aid than uniting the Church. The decline of the Eastern Church was matched in the West by the decline of the Papacy, particularly in the Avignonese Captivity (the Papacy was controlled by French nobility and seated in France). At times there were two or three Popes. Proto-Reformers like Wycliffe and Hus arose. The church East and West was in sad shape at the end of the Middle Ages. This is another insightful and interesting volume. It has good balance between East and West. It deserves a reading by all interested in church history. Much of the music of my youth was the music my brothers listened to. When I got older, I often plundered their record collections to make tapes. One of my brother John’s favorite bands was The Beatles. He was not alone, to say the least. listened to lots of music by The Beatles in the basement with my cousin (along with plenty of Elvis). T here are too many good songs, and good albums. Trapped in a corner, under threat of death I’d likely say my favorite album is The Beatles aka The White Album. The LSD period was over. The songwriting for this album took place in India. There was plenty of meditation, some marijuana and upset stomachs, primarily Ringo’s. It was a period of turmoil in the band. Ringo had to be talked into recording. George’s songwriting was limited. And Yoko Ono showed up. My favorite is Glass Onion, which does have a strong psychedelic feel to it. 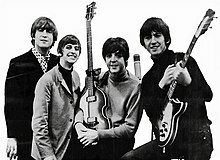 John wrote the silly lyrics to tease those who thought there were secret messages in the songs. I can’t really explain why I like this song so much, but I do. While My Guitar Gently Weeps is another fantastic song. George was unhappy with how the group played it at first and invited his friend Eric Clapton to play on it. This song has stood the test of time. I love the guitar work. The piano accompanies it well. This is probably the best song that George wrote. Helter Skelter, about a spiral slide at playgrounds, is a playful romp that was originally a longer blues rock jam. Their shorter attempt was a bit more chaotic, which seems to be appropriate. You can’t plan that. Too bad Charles Manson gave this song a somber note as the inspiration for his mass murder. Musically this is a very diverse album. That was one of the strengths of The Beatles. They had no identifiable sound. They started singing pop songs, silly little love songs. As they matured the explored more subjects. They struggled with fame and that shows up in their songs. They used technology as an instrument pioneering the way for bands like Pink Floyd. Their experimentation with drugs created a distinctive second phase in their career paralleling the expanded subject matter. Their storied career is what makes picking just one album from that decade so difficult. I could easily have chosen Rubber Soul, Revolver, or Help! 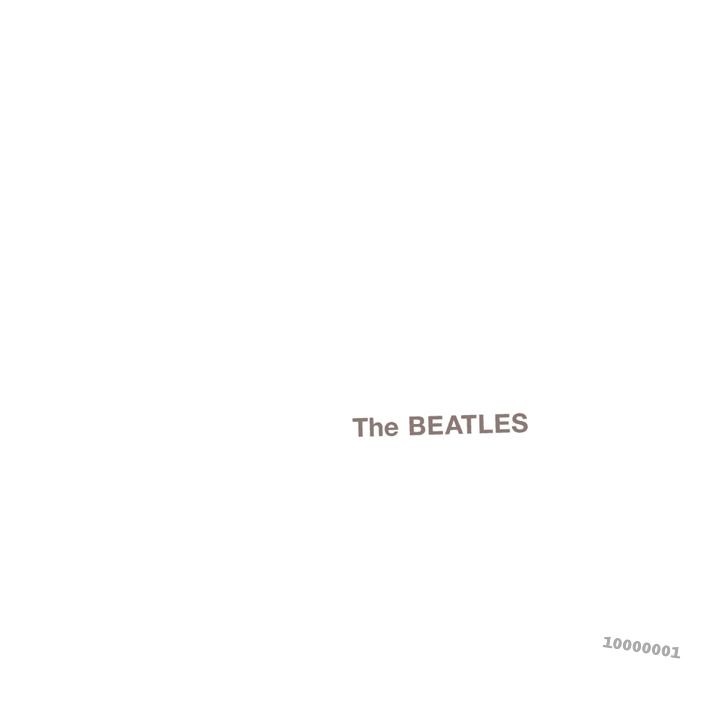 I went with the White Album.